Part 32 - Hebrews11:17–19 Ultimate obedience. It is impossible to miss out the event referenced in 11:17-19, known as the ‘Binding of Isaac’ or the Aqedar, but very hard to say anything sensible about it. There are references in the Old Testament to child sacrifice (including the awful mistake of Jephthah in promising to sacrifice the first thing he saw when he got home which turned out to be his daughter, Judges 11:29-40) but never in a positive sense. Presumably the lack of comment means that it was a practice regarded with so much distaste in Israel that it did not need comment upon. It was not such an uncommon practice amongst the surrounding tribes. The clear teaching of this episode is simply that true faith demands obedience. Which was fine for Abraham who seems to have had a hotline to and from God. We struggle much more to know what we should do as a matter of obedience. We need to be careful. But if the Lord does really want us to do something unusual, something we would naturally not think of doing ourselves then he does make it quite plain to us. (That has happened to my wife and myself at least three times in an otherwise unremarkable Christian life.) Most of our decisions as Christians are ones that we have to take for ourselves. Dont believe people who think the Lord directed them to a particular spot in the local car park! They are trying to make themselves sound very holy and spiritual. But we have been given wonderful minds that enable us to sort out for ourselves where we can park our car and a myriad other everyday decisions. Abraham was tested far beyond anything he might have expected the Lord to require of him. And I wonder what the effect on Isaac was. Probably a strong young teenager with all his life in front of him he must have been shocked to his very core when he realised what was to happen to him. I wonder did his mother, Sarah, know what was happening. If so, how terrible it would have been for her. Abraham seems to have assumed that the Lord would give him a way out. He had been told, by the Lord, that he would have an infinite number of descendants, which this command seemed to put at huge risk - could Sarah have another son when she was even older? We are not told whether Isaac knew of the great promise of untold numbers of descendants, or not. The aqedar , potentially at least, lies on the middle of the spectrum of Biblical father-son problems. Better in a way are the situations of the deaths of Saul’s son, Jonathan, fighting the Philistines beside his father and of the death of David’s son, Absalom, when he challenged his father for the throne of Israel. In neither of those cases was the son actually killed by the father, so they are a little easier. The situation which was far worse was what happened to Jesus on the cross. There he not only died, not quite at the actual hands of the Father, but with his full knowledge, agreement and ability to intervene - not used. Think on that. Meditate on that. Jesus died, as Isaac did not, for you and for me, as the one true and all sufficient sacrifice. All these people died still believing what God had promised them. They did not receive what was promised, but they saw it all from a distance and welcomed it. They agreed that they were foreigners and nomads here on earth. Obviously people who say such things are looking forward to a country they can call their own. If they had longed for the country they came from, they could have gone back. But they were looking for a better place, a heavenly homeland. That is why God is not ashamed to be called their God, for he has prepared a city for them. NLT. Church can be very boring, can’t it! (That’s a statement you wont often see.) Perhaps you have been going to church for many years, decades even. Every pastor has a cycle length, that is, after a certain length of time they have said all they know and are really just repeating themselves even when the scripture being preached from is different. A weak pastor may only last for a few months before the repetition starts. Most pastors can only manage a few years. Only those who spend a lot of time studying can keep going beyond the memory of their congregation. Then the songs or hymns may have become too well known and the tempo of the singing may be so slow it is boring. If the church follows a liturgy it may become increasingly difficult to focus on the liturgy and not what you have got to do in the garden next, or what would be best for the next meal. Perhaps, if the truth were known, most people are turning up in church not for the service but to meet their friends afterwards. Oh, dear - you will be thinking this is a very jaundiced view of church. Yes, it is. Fortunately we are all people of habit and once the idea is firmly planted in our brains we tend to turn up every week in the hope that things may have changed. Life will have been very boring for Abraham and family too. Ur to Haran would have been more than 800 miles. Guessing more than a bit - they would have been able to move only about every third day. They would need to send a scouting party ahead to find water and agree where they could pasture their animals. When they did move they would only cover about 8 miles a day with a mixed family party. The net result is that they would have taken about a year to cover the ground that far and they would have to put up and take down their tents about 100 times. All that would be very difficult and rather boring. Going from Haran to Egypt - they did not stop where they should have done because of famine - is about the same distance. So that would have been a second year of travelling. It’s no wonder that the writer says they did not receive the things promised but they saw it all from a distance and welcomed it. Obviously people who say such things are looking forward to a country they can call their own. If they had longed for the country they came from, they could have gone back. But they were looking for a better place, a heavenly homeland. That is why God is not ashamed to be called their God, for he has prepared a city for them. That was the sort of stickability they showed. Our writer has described that because he thinks we, helped by the Holy Spirit and our knowledge of what Jesus did for us, should show the same sort of stickability. A few daft people (like my wife and I used to) love to go trekking and sleep on the ground in a small mountain tent. But that is not most people’s idea of an enjoyable way to spend their holidays. The amazing thing about Abraham is that he not only set out on a long trek, sleeping in tents himself but also persuaded all his family, including his father, to do so. It was, of course, the senior male who was expected to decide what should happen. It seems that Abraham was such a strong and forceful character that he was able to determine what happened. It was a quite remarkable thing to do. They lived in Ur, one of the greatest and best cities of the ancient world, where they would enjoy all the luxuries that were going. In some way, that is not explained, the Lord spoke to Abraham and instructed him to set out with his whole family on a journey to somewhere - he wasn’t told where. They journeyed north, then west, then south round what is known as the fertile crescent, a great arc of land round the deserts to the south. It proved too much for his father Terah, who gave up halfway and settled in the city of Haran. We can only imagine the big arguments that there must have been between Abraham who had received the direct instructions from the Lord about what they were to do and Terah, who hadn’t. Abraham will have been stuck there until his father died and he had complete control of the family. It was probably in Haran, when the family was stuck there that he received his great commission from the Lord. He, and his descendants, were given the task of bringing blessing to all the world (Genesis 12: 1 – 3). So much had gone wrong. Adam and Eve had disobeyed the Lord, one of their sons had killed the other, the world had become such an evil place the flood was sent to sort it out and finally the tower of Babel had indicated the arrogance and conceit of mankind. To bring blessing to all that sort of thing was an immense task. In fact Abraham and his descendants, the people of Israel failed. Only when Jesus came as the ideal Israelite was any progress possible. But Abraham was not to know that. His job was simply to obey - as he did. We will probably never get as clear and startling a call as Abraham. Which, you may think, is just as well given how comparatively weak I am! But don’t get too comfortable. My wife and I were into our 50s before we got a call to go to Pakistan. We didn’t hear a voice, but received such an amazing sequence of events that it was quite clear what we were being asked - or was it told - to do. We did not realise that the best years of our lives were in front of us. Abraham can scarcely have enjoyed the call he received as much as we did ours. Part 29 - Hebrews 10:32-39 - The power of faith! With chapter 11 we start into the writer’s great gallery of Old Testament saints. The introductory verse starts off with 2, or is it 3, great words. The most important one is ‘hope’, then to support ‘hope’ we have ‘faith’ but that is not sufficient as just one other word. ‘Faith’ in common usage is often thought to be the same as ‘believe’ but believing all takes place in our heads. The following list of people of faith clearly shows that there is more to it than just what happens between our ears! There is a great deal of activity involved as well. We can call this either ‘endurance’ (10: 36), ‘trustworthiness’ or ‘faithfulness’. Let’s settle for the last of those - which is part of the meaning of the Greek word, which also means ‘faith’ in the more restricted sense. To see what ‘faith’ has to do with ‘hope’ we must think a bit about what we mean by hope. It comes in three basic varieties. There is the hope of most people that they will be able to live a good and satisfying life. Some people, I suppose, just drift through life without thinking about where it is going and without any long term ambitions - but they are not us, or you wouldn’t be bothering to read these notes! The second sort of hope is our hope for what will happen to us when we die. Have we then a hope? The third and final sort of hope is the small hopes that we have every day. ‘I hope I will soon be rid of this cold’ we say. Or ‘I hope I get such and such a Christmas present’. Our writer is not at all interested in that third sort of hope, but he is very interested n the first two. In his thinking the two of them are closely woven together. He talks about the way in which Enoch was taken up to God, about how Abraham was looking forward to ‘a city that has foundations’, and how they, and many others, were ‘seeking a homeland’. All these things are closely connected to their lives in this world and particularly their faith and faithfulness. They did not really understand where they were going. We, living after the life, death and resurrection of Jesus have a much better idea of what we are doing, where we are going and what the effects are going to be. We, if we put our trust in the Lord, thus having faith in him, can expect to be accepted by the Lord in the day of judgement and, filled with that knowledge, will strive to live a life of faithfulness throughout our time in this world. Our good and gracious God will accept us on the basis of our faith in Jesus but has also promised to reward us according to our faithfulness in our lives with him, ‘ For no one can lay any foundation other than the one we already have—Jesus Christ. Anyone who builds on that foundation may use a variety of materials—gold, silver, jewels, wood, hay, or straw. But on the judgment day, fire will reveal what kind of work each builder has done. The fire will show if a person’s work has any value. If the work survives, that builder will receive a reward. But if the work is burned up, the builder will suffer great loss. The builder will be saved, but like someone barely escaping through a wall of flames.’ (1 Corinthians 3: 11 – 16, NLT). We are sure that this is the way life works because we have read the scriptures, seen how Jesus lived and died, and wondered at the great illustrations of warriors of the faith that we read about in this chapter. We may not have seen these things. But Jesus himself said, ‘Blessed are those who believe without seeing me.’ The people of old were accepted that way - so shall we be! Build for yourself a good foundation so that you will not be ashamed when you appear before the Lord on the day of judgement. 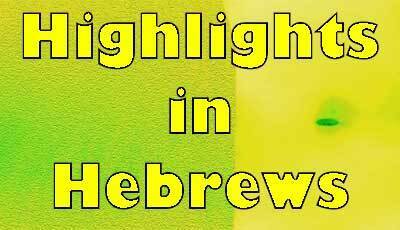 Part 28 - Hebrews 10:32-39 Not everything goes well! There seems to be a strong tendency, at least in this country, to think that becoming a Christian and setting out to follow Jesus is a cure for all the problems we may otherwise have. That is not the way it works! Life for us is not likely to be as difficult as it was for the people this book is written to. We do not know exactly where they lived or what their background was ,but it is clear from this passage that not everything had been easy for them. They were probably Jews, since the book is called ‘to the Hebrews’ so they may well have had a lot of trouble from other Jews who did not believe in Jesus. Very soon after the foundation of the Christian church there was a lot of conflict between Jews and Christians, Paul being one of the chief culprits. Before long the Christians were thrown out of the synagogues all together. Then the ordinary citizens of the Roman empire will not have liked being shown up for the self centred and unpleasant people many of them were. It sounds as though the early Christians had a ministry to prisoners, which was not well received by other people. They had things stolen from their houses and could get no support from any judicial powers to recover what was stolen. Since this is going out all over the world some things like those may be your experience but that is not all that likely. Our problems may be much more ordinary and personal. Perhaps they are physical, we simply are not well, or are suffering the products of old age and their tendency to drag us down. They may be social as we struggle with family, friends and enemies. They may be psychological and mental – there is no guarantee we will avoid such things by following Jesus. We should be better off as Christians as we turn away from bad habits of drinking or drugs and seek to follow a generally better life style. But following Jesus is not a general cure for all ills. Why then should we follow Jesus? If not for our personal improvement, why? The answer is simple and devastating: because he is who he is. He is the Lord. He is the King of the Kingdom. He is the Lord of creation and of this world’s continuing existence. We should set out to follow Jesus because of who he is and not because of who we are. If, indeed, we did start to follow him from purely selfish motives he is a good and loving Saviour who will allow you to learn what your motives should have been and slowly, as you come to understand more, change your motives to those that they should have been in the first place. We can still ‘have faith and preserve our souls’ (10: 39) and receive a ‘better possession and an abiding one’ (10: 34) and receive the ‘great reward’ that ‘is promised’ (10: 35, 36). The necessary ‘endurance’ (10: 36) can be ours even if we did not really start for the best and right motives. Many countries require a person to have a visa before they are allowed into the country. The visa will often say how long they can stay in the country. If, after entering the country, they sneak back out of the country before the visa is up where there is no entry/exit point and then present themselves to re-enter the country at a proper entry point they would be likely to be in serious trouble. That is something like what the writer is thinking about here. We received a visa to let us into the Kingdom of God when we first started to follow Jesus. Our writer says we simply cannot leave the kingdom for a while; live in the kingdom of the world; and then return to the kingdom. There is a very important and strong reason why this is so. We may belong to all sorts of clubs: golf, football, book reading or cookery etc., leave the club, cancelling our subscription, and return to it later. But unlike all these clubs the other factor in the kingdom is God himself. On entry to the kingdom we receive the gift of the Holy Spirit. He cannot be accepted one minute and returned months or years later just because we want to do something else. We effectively do that if we continue in deliberate sin. The Old Testament is very definite about this. There are two sorts of sin: unintended and ‘with a high hand’, that is defiantly, quite deliberately and intentionally (Numbers 15: 27 - 31).. The former can be remedied by offering repentance and sacrifice, but for the second there is no such remedy. Unfortunately there seems to be a great deal of teaching around in this Western world in which God is a kind of benevolent grandfather figure who will accept almost anything from his grand-children merely patting them on the head and saying ‘don’t do that again - it is not nice’ or some such comment. We must not forget that we are dealing with the Creator and Sustainer of this world of ours and all the universe. He is a holy God who does not like - will not accept - impurity. Day after day every priest stands and performs his religious duties; again and again he offers the same sacrifices, which can never take away sins. But when this priest, Jesus, had offered for all time one sacrifice for sins, he sat down at the right hand of God, and since that time he waits for his enemies to be made his footstool. For by one sacrifice he has made perfect forever those who are being made holy. Our writer likes to make sure we have heard and understood what he has said. So he repeats himself. Here he repeatstwo things in particular he has already said: that Jesus sat down and that the covenant had been renewed in its new form. These days a great many people sit down to work and only stand up when it is finished. It was the other way round for them. Nearly everybody stood up most of the time when they were working. It was only at the end of the day, when the work was done, that they were able to sit down. Jesus sat down at the right hand of God - the place of privilege - because his work was done and would never need to be done again 10:12. Unlike the previous sacrifices carried out in the temple every day his sacrifice was complete, perfect, finished. The sacrifices of animals had been but small tokens of the repentance of the person sacrificing and the forgiveness received from God in response to that repentance. The sacrifice of Jesus, the very Son of God himself, had been so far more effective than those it would never need to be repeated. In fact, how could it possibly be repeated? Any further sacrifice could only be the tiniest reflection of what Jesus had accomplished, not really worth the bother! The sign of the new covenant, the new way in which God was choosing to deal with people, was not to be a sacrifice but a memorial of that one great sacrifice. The sacrifice could not be repeated; only our memory of it could be, and should be, repeated. So Luke says: “he took bread, and when he had given thanks, he broke it and gave it to them, saying, “This is my body, which is given for you. Do this in remembrance of me.” And likewise the cup after they had eaten, saying, “This cup that is poured out for you is the new covenant in my blood. (Luke 22:19-20). Sadly it is not always the case that this is how our memory of him is presented. If we call people ‘priests’ we need something for them to do so we invent altars and a sacrifice for them to do on it. There is no beginning hint that that is the right thing to do here in the New Testament and, in particular, in this book of Hebrews. If you belong to one of the churches where this is the way things are thought about it may not be possible for you to withdraw. If so then you have to attend that sort of service but you need to say to yourself very clearly every time that what you are doing is remembering that great moment of sacrifice when Christ cried ‘it is finished’, a moment never to be repeated, only remembered. What is the effect? We are made holy, made acceptable to appear before the Lord God now and at the end of days. If we have been brought up in a Christian environment it is very easy to overlook the fact that our faith is founded on a human sacrifice! So we cheerfully talk about the sacrifice of Christ on the Cross. For those who have not got that sort of background it can be a real stumbling block to them thinking of Christian faith. Paul recognised that when he said “we preach Christ crucified: a stumbling block to Jews and foolishness to Gentiles”. Even when we think about that verse we may well concentrate on the crucified bit and not think that this means the death of a human being. In almost all the world human sacrifice has been rejected from the beginning even where there is no necessary connection to Christian or Jewish thought. Once we have accepted the idea of sacrifice it is not difficult to see meaning in it as we did in our last highlight from Hebrews. But why sacrifice in the first place? Animal sacrifice comes into the Bible very early. Animal death is necessary for God to clothe Adam and Eve in ‘garments of skin’ in Genesis 3: 21. It is probable that Abel’s sacrifice was accepted by God and Cain’s was rejected because Abel was a herder and brought animal parts as an offering while Cain was a farmer and brought fruits (Genesis 4: 2 – 5; Hebrews 11: 4). Sacrifice was by no means limited to the nation of Israel. It was commonplace in all the surrounding nations. The crucial difference was that the line of Abraham had a strong and well defined sense of sin and that the purpose of sacrifice was to cover that problem. Other peoples thought of sacrifice basically as an appeasement of capricious gods to try and improve their tempers and get on the right side of them. Biblically sacrifice was about human shortcomings whereas most other thinking was about the gods. Sin in the early chapters of the Bible is all about the breaking of relationships, particularly those with God, rather than with any infringement of a law. In a way nothing much has changed. We still sin because we break relationships with each other or with God. Even the original sin of Adam and Eve was not really about the eating of the fruit so much as disobeying God. it was more a matter of a relationship broken than a wrong action. The penalty for the broken relationship with God was death. Not physical death immediately in the garden of Eden but spiritual death - the death of an unblemished relationship with God. The same principle still applies. How could immediate death be averted? Only by a substitute death - that of an animal substituting for the human being. So throughout the Old Testament animal after animal died to carry the many sins of human beings. Was there any way that continual death could be averted? Only if something or somebody of eternal worth could die in their stead. And so Jesus went, voluntarily, to his death so that you and I could be forgiven our sins, particularly our sins of breaking relationship with God. Was there any way that continual death could be averted? Only if something or somebody of eternal worth could die in their stead. And so Jesus went, voluntarily, to his death so that you and I could be forgiven our sins, particularly our sins of breaking relationship with God. People have sometimes died for other people. Like the firefighters who went into the Twin Towers in `New York in 2001 to try to rescue other people. The difference between their action and that of Jesus is that they went in hoping to live even as they took the enormous risk of going back into the towers. Jesus knew he was going to die. He could have walked away from the squad sent to arrest him as he did from the lynch mob in Nazareth (Luke 4: 28 – 30), but he did not. He could have used his superior power over Pilate, but he did not. He could have walked away from the terrible scourging and the mocking of the soldiers, but he did not. He could have nailed the execution squad to the cross in his place, but he did not. Jesus, not just man but also God, died for you and for me, deliberately a human sacrifice for sin. “He did not use his equality with God to his own advantage … he was obedient to death” (Philippians 2: 6, . We are forgiven as a result. Worship him.